Our online food ordering system can stand alone as a website, or can be fully integrated into a restaurant or catering service’s existing website by simply adding an Order Online button. It can also be made available to customers as a branded mobile app for Android, iOS, Windows devices, or even as an app on Facebook. We can help you get to where your customers are. The power of our service does not end there. Any orders that are approved and paid for by customers using a variety of means can be made to funnel into the computerized system already in place in your kitchen. Customers do not have to do anything special, and neither do you—we do it all for you. From building the code, and designing the best look using your colors, logo, and photographs of your menu items, to setting up secure payment portals. In addition to making it easy for customers to choose and buy the food they want to order, we also accommodate restaurant loyalty programs, and can generate maps to allow customers to locate branches quickly. Using our food ordering system, customers can monitor the status of their delivery through SMS notifications, email, or through app notifications. The competition is charging on average 15% of the sale! This is outrageous considering most restaurant are making 20-30 cents on the dollar. They are taking more than half your profit! Our system comes at a fixed rate which falls at about one-third of the cost of the competition. We also do not have a service charge per sale, like other online ordering systems do. While they generally charge 15% of the cost of a sale, we merely charge a fixed flat rate. We also provide premium support for free. Using our system, online ordering for restaurants has never been easier or more cost-efficient. Our customers have seen close to $1,500-$5,000 in monthly sales by day 90! We would be happy to give you a free demonstration on how our system works, and talk further on how we can assist you in giving your customers what they want—wonderful food, at a reasonable price, quickly and with as little hassle as possible. Where Do Your Online Orders Come From? The age before online ordering was a messy one. Do you remember the earlier days of the restaurant business? Calls would come in, orders would stack up, and sometimes, they would even get lost. And it was a “catch up or give up” sort of mentality when it came to finishing orders on time. But Now, There’s a Better Way! Thankfully, we don’t have to live in that world anymore. 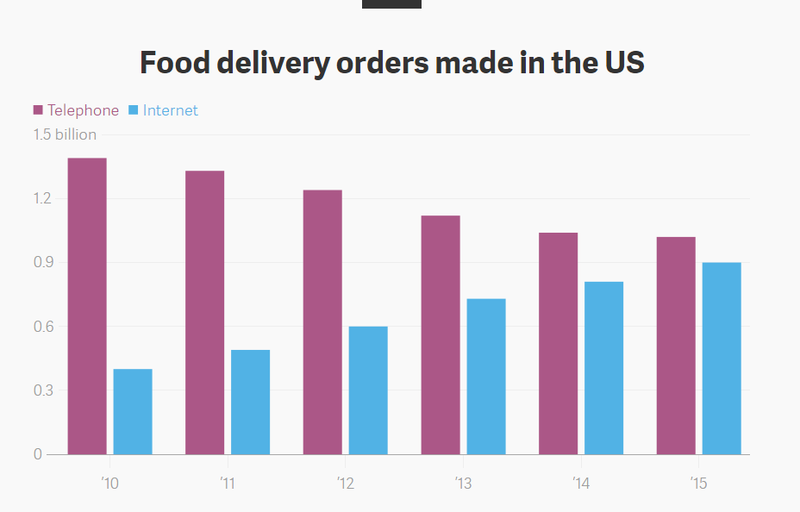 In the digital age, online ordering has come to save the day. It gives customers a fast and easy way to order. So rather than having tickets piling up in the kitchen, you can have more time to interact with customers and build lasting relationships! The question is, where do your online orders come from? 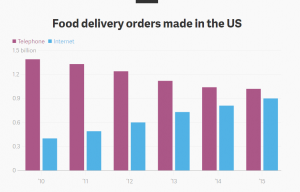 The world of online ordering is bringing in big revenue streams for the restaurant industry. In fact, most online orders and restaurant searches come from Google alone (a whopping 53%)! It just doesn’t make sense to not have a personal online order system for your business. Because if you don’t, then someone else will. That’s right, there are third party providers out there that are more than happy to reap the profits of your business and stand between you and your customers. They collect a hefty 10-30% per transaction. That’s money out of your pockets! Food Online Ordering Systems Will Help You Beat Your Competition! And above all else, you get to keep nearly all the profits! Our services will allow you to retain customers and draw in new customers with a custom online ordering system that fits your brand. We’ve partnered with companies like EPSON and Google to deliver world-class food ordering systems. It’s designed to work with any in-house POS system. And, it prints the orders directly to your kitchen. This is available to you for a low, flat rate that is 60% lower than the current leading online ordering solution. Take Control of Online Ordering with Food Online Ordering Systems! Sign up today by calling 855.747.3312 or visit www.orderfood.menu to get a free estimate on what you can be saving using our online ordering calculator.